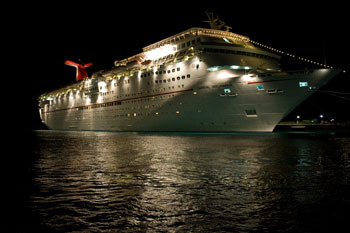 The accommodations for this wedding cruise were arranged by Cruises Plus, Inc. The agency handled all onboard arrangement for guests, including those with special needs such as wheelchairs or diabetes. Lots of detailed planning went on behind the scenes with various departments at Carnival Cruise Lines to make sure that all events were successful. Cruises Plus and Carnival staff worked from November to March to finalize all of the details and confirm the timeline for the family. When the day finally arrived, the family and their guests were welcomed onboard by the traditional cruise buffet with special touches honoring the bride and groom, like an ornately carved watermelon. Like many families, they wanted to incorporate traditional ceremonies into their wedding, which included starting off the cruise with Mehendi for the ladies. Pujas were also included throughout the duration of cruise and were held either in a suite or in one of the lounges. On the first evening, while the group was at dinner, a team of professional decorators, cruise coordinators and cruise line staff worked behind the scenes to get the show lounge ready for the Sangeet. The lounge looked even more spectacular with decorative pillows, special LED lighting and other ornamental touches, designed by Suhaag Garden Design Company. Carnival is able to accommodate all types of traditional celebrations, not only decorations for Sangeets, but also dandiya for a Garba. 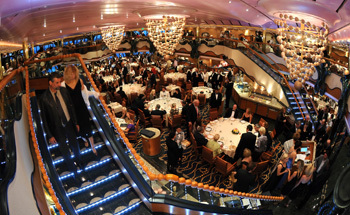 One of the most memorable aspects of any cruise is the dining experience. 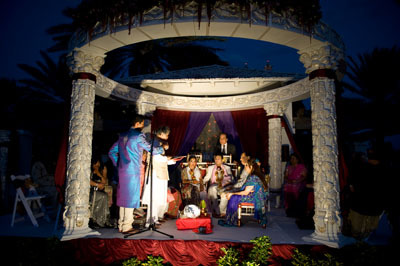 For many Indian families, the food served at the wedding is one of the most important details. Few people realize that many of Carnival’s chefs are Indians from a variety of regions. Our chefs take great pride in creating traditional dishes for our Indian wedding families. For a wedding cruise, traditional breakfast, lunch, and dinner are served in the formal dining room. Both vegetarian and non-vegetarian dishes are offered at all meals along with the regular cruise menu. Masala chai and masala omelets are among the breakfast items offered. For both lunch and dinner, the tables are set with papad, pickles, and of course, naan. Guests can expect dishes such as murgh masala, chicken tikki masala, paneer makhani, dal, and for dessert, kulfi and gulab jamun. Specific Indian dishes can also be requested to customize the menu. For this particular family, they decided to incorporate the cruise with a destination wedding in the Bahamas. The guests were able to enjoy themselves with all of the activities and events on the cruise ship and then were treated to a wedding ceremony at the Atlantis in Nassau. Once back onboard the ship the following evening, the family and guests celebrated with a lavish reception complete with a champagne toast, hot and cold hors d’oeuvres and a custom wedding cake, courtesy of Cruises Plus. They even brought their own DJ and comedian, who entertained their guests until the early hours of the morning. * In planning your cruise wedding, you will need at least 9 -12 months to make sure all of the details are arranged properly and to give your guests time to plan. Every cruise wedding is unique and time is needed to work on the customization. * Cruise package pricing is going to include stateroom accommodations, dining, and the cruise ship entertainment. The package is also going to include space for your onboard events. Keep in mind that there will be additional charges for other types of vendors that you bring onboard such as make-up artists, decorators, DJs, or other services. There may also be additional charges for the wedding cake, technical staff, and housekeeping staff depending on your cruise package. * You will also need the expertise of a cruise coordinator with cruise wedding experience. Best wishes to the Mahtani/Dodani families!! We look forward to welcoming YOU onboard for your cruise wedding! For more information and to start planning your dream cruise wedding, please contact Su Patel at 912-355-5697 or su@cruisesplus.com Su Patel, owner of Cruises Plus, handled the planning and cruise details for the Mahtani/Dodani family. For over 20 years, Su has been a cruise coordinator partner for Carnival and knows the ins-and-outs of handling a wedding cruise.